There is perhaps no more iconic symbol in auto racing than the checkered flag. Every driver wants to see it waving overhead as they roll across the finish line first, signifying them as the victor. However, the history behind this tradition is somewhat cloudy, and its origins have been somewhat lost to the ages. 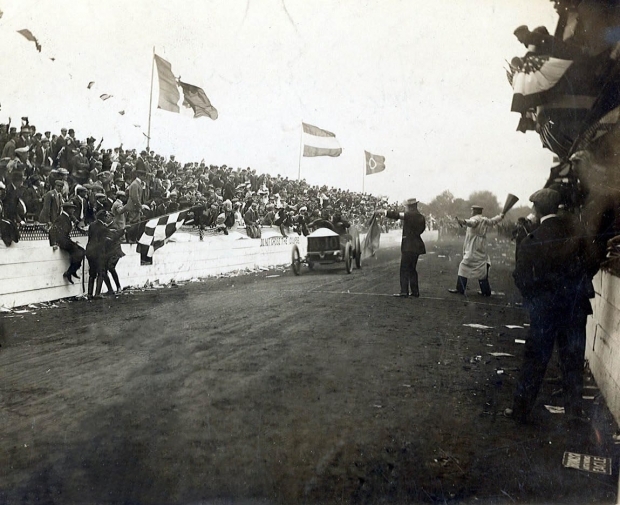 On this blog, we examine a few of the stories and theories of where the checkered flag originated as part of auto racing. The earliest uses of the checkered flag are somewhat disagreed upon. Some historians believe the first uses of the checkered flag can be credited to the French, who would wave it at the end of bicycle races throughout the country, however this is not a popular belief. A slightly-more popular but still largely contested theory dates all the way back to the initial settling of the American Midwest. One of the most popular sports on homesteads was horse racing, and events frequently also included a large public feast. Those preparing the meal would wave a large checkered-pattern tablecloth of the era to indicate that the racing should come to an end quickly and to come eat. By the late 1800s and early 1900s, racing had become a sport for the wealthy, and the Ormond Beach Hotel, located roughly 10 miles north of Daytona Beach in Florida, had become a hotspot for auto races. In 1902, Random Olds (the founder of Oldsmobile), became one of the first land speed record holders when his car made a run on the hard-packed beach timed at 50 miles per hour. But whether he or Henry Ford (yes, the Henry Ford) was the first to cross under a checkered flag is a mystery: there is no photographic evidence as to whether or not the checkered flag was used for either of them. The first evidence of this nature is a photograph of the 1906 Vanderbilt Cup race in Long Island, New York. That same year, Sidney Waldon of the Packard Motor Car Company used the checkered flag to indicate “checking stations,” or “checkpoints” along the route of the Glidden Tour rally race events. By this time, auto racing was coming into its own as a wildly popular sport across the country, with numerous races across dirt, asphalt, and sand being competed every year. The checkered flag took on a critical role in auto races because it was highly visible through the dirt and dust propelled into the air by cars, particularly in dirt track races. Dirt tracks were much more common than asphalt ones at this time. The “double-checker” image, which has become an iconic part of the Indianapolis 500, one of the biggest auto races of the year in the United States, was first used in 1980 by flagman Duane Sweeny, who waved two different flags in sync to signal the winner, a practice that is still used today. Have the urge to chase the checkered flag for yourself? Head over to the newest attraction in high-speed thrills in Minnesota: MB2 Raceway. At our Minneapolis indoor karting facility, we offer the excitement and intensity of high-speed, action-packed go-kart racing in a safe and friendly environment. We offer races in a daily arrive-and-drive format, as well as group rates for birthday parties, corporate events and more! For more information about our racing experiences, call MB2 Raceways today at 866-986-RACE.